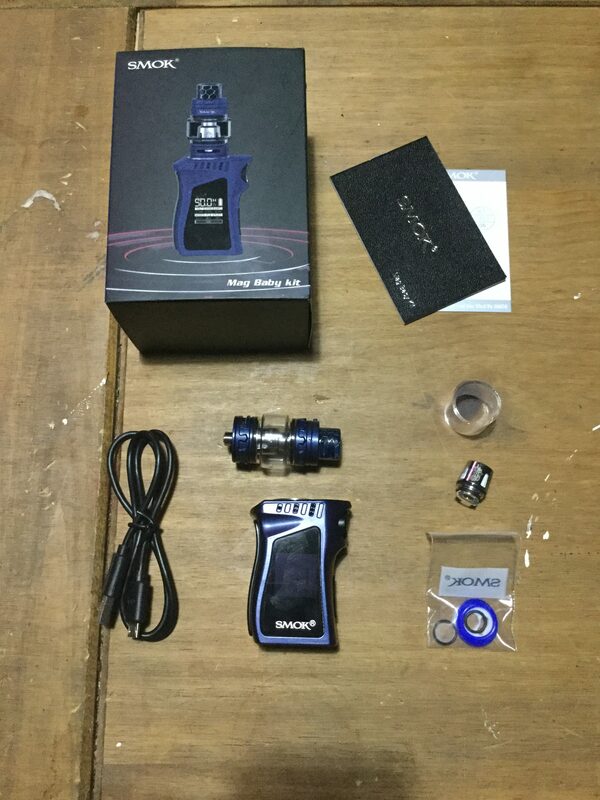 Hi , In this review i take a look at the Mag Baby 50W Mod Kit with TFV12 Baby Prince Tank from Smok. 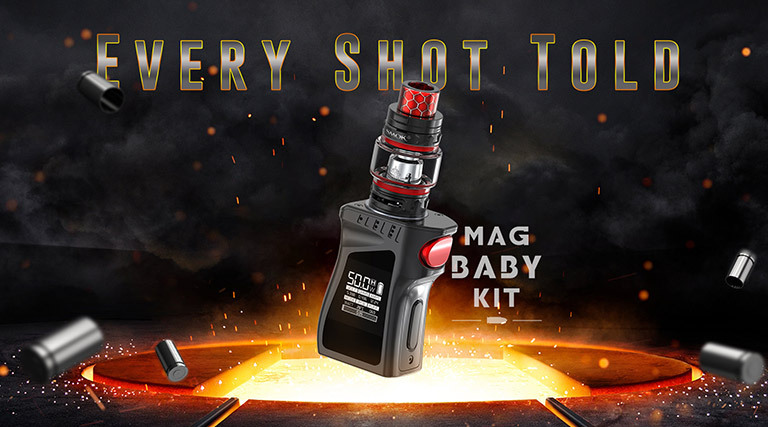 The Baby Mag is a tiny pocket friendly version of the ergonomically friendly Smok Mag device, and also comes with a baby version of the prince tank. The device itself warrants the Baby Mag title due to the almost identical pistol handle shape of it’s parent but once the aesthetics and ergonomics are taken out of the equation the tiny 50w device with a built-in 1600mAh battery has more in common with the Q-Box a small device that packed a punch, so what sort of a punch does the Baby Mag pack? I give my humble opinion. 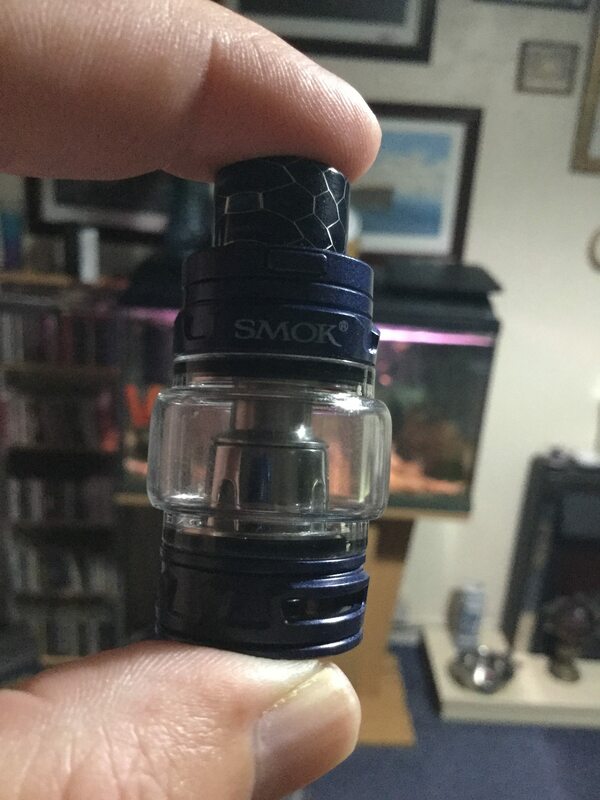 The Baby Mag comes in typical Smok packaging and is a tiny version of it’s parent the Mag. The Baby Mag like the Mag is shaped like the handle section of a gun, giving the device a pistol grip. Whatever the rights or wrongs of this there is no denying the ergonomics are unrivalled in my opinion. I received the Navy Blue Black version that comes with a matching Navy Blue Tank, it’s also available in Black Red, Red Black, Silver Black, Black Prism, Gold Black, Purple Black, Green Black, and Pink Black. One side of the device has a trigger fire button at the top and underneath the device is curved, on this curved section is a Black panel that houses a Black pill shaped rocker style vertical bar for the navigational buttons, your 3 fingers (your other finger is used for firing) rests on this section comfortably and as explained later you don’t alter anything by mistake despite the rocker being there. The opposite side is again shaped to make the palm of your hand feel comfortable and has a raised black panel with venting. 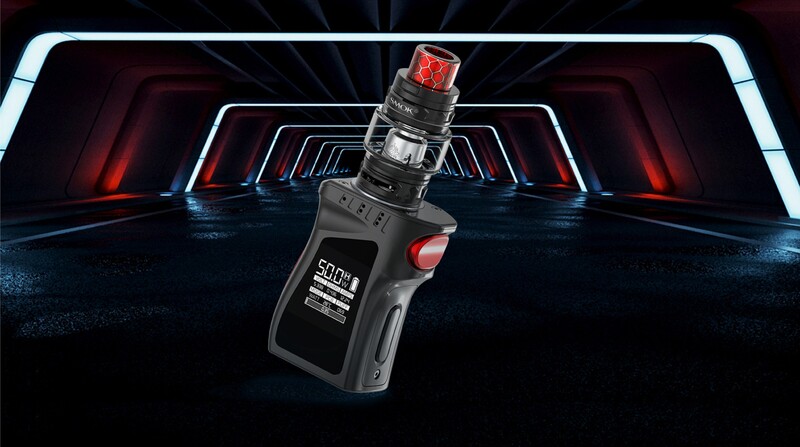 The front of the device has a mirrored black panel shaped to match the contours of the device which houses the 0.96″ OLED screen, at the bottom of this panel we have “SMOK” printed and at the top of both front and back we have more venting. The back of the device has a Carbon fiber sticker that’s shaped like an upside down hockey stick, to the side of this is a vertical micro USB port and a reset hole. The bottom of the device has branding and safety stamps printed in bright White, moving to the top we have a 510 plate which is raised one side to be level as the top of the device is slightly slanted, the 510 is Gold plated and spring loaded. The tiny device is well made and the finish on mine seems durable. 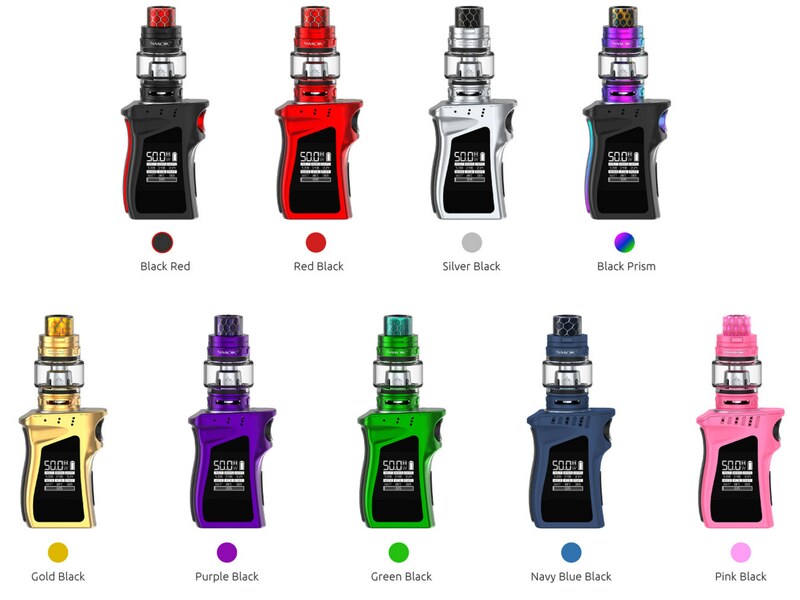 These are the colour choices when buying the tank separately the colour with the kits matches the device. The Baby Prince has been reviewed countless times and when i say that i actually mean the Baby Beast as this uses Baby Beast coils and to me seemed to vape exactly the same way as the Baby Beast. The tank has the aesthetics including the heavy texturing around the base and top of the Prince and also has the Prince’s lock mechanism. 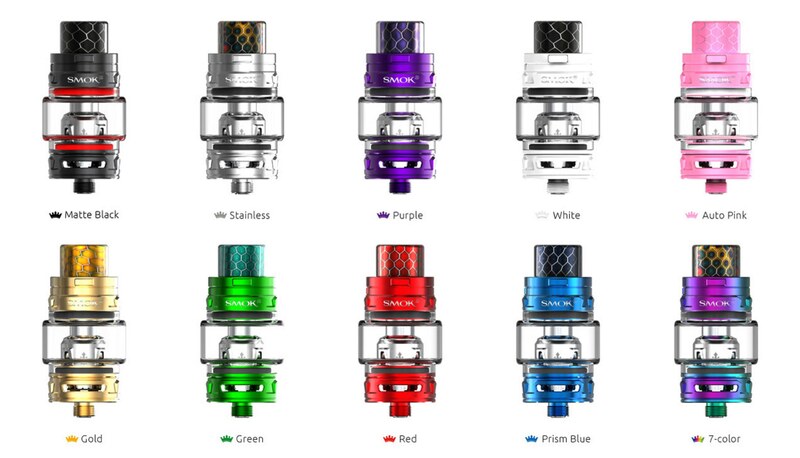 The Baby Prince is top-fill and with the pre-installed bubble glass the capacity is 4.5ml it also comes with a 2ml straight glass, the tank comes with a cobra style 510 drip tip that can be changed for your own. 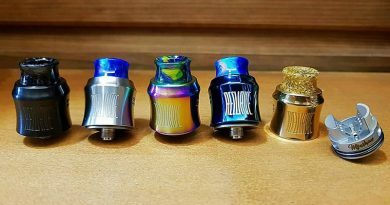 The coils as mentioned uses the Baby beast coils that screw straight into the base, 2 coils are included which are the pre-installed Q2 0.6ohm which i found best at 45w and the M2 0.25ohm which i found the sweet spot at 40W. 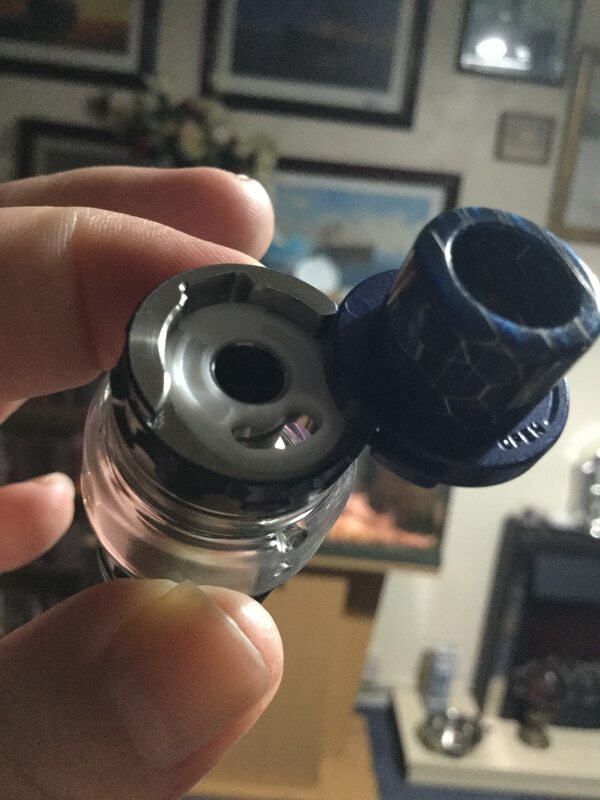 My preference was the Q2 coil but both gave really good stock coil flavour. The Baby Mag is the standard 5 clicks on but once on 5 clicks locks and unlocks the device including the fire button and the device can only be turned off via the menu system. 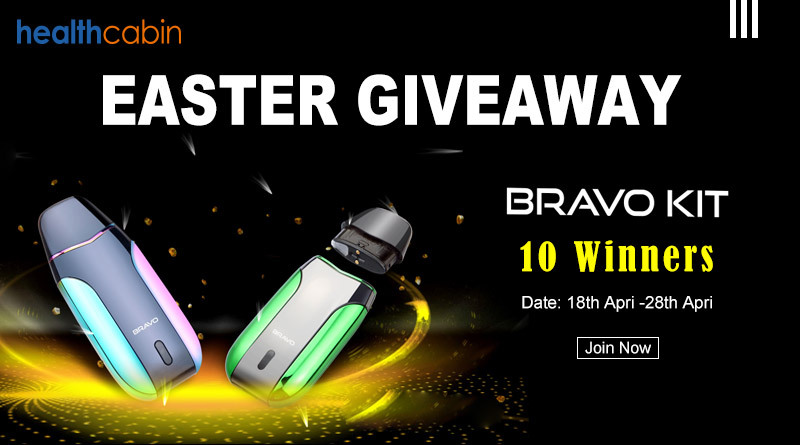 Once on you are met by a large bright screen which display almost looks old fashioned such is the fast pace world of vaping but actually the display and menu system was used regularly by Smok up to only about 9 months ago until the ProColor bought in the now familiar Smok Colour interface. The display and menu worked well then and still is the case although some might find the screen rather cluttered with information (displaying watts/temp, preheat, battery status, voltage, ohms, amps, mode, PCB temp, puffs and a time vape progression bar) all on the main screen, I personally find the screens size and uniformed layout works well allowing me to see all the information clearly but those that prefer just having the minimal amount of information displayed have a fair point of view, i can see the merits in that also. There are some short cuts so for common features you can avoid going into the menu system, fire and down together brings up the mode options that you can scroll through and choose, when in wattage mode fire and up brings up preheats so you can pick between normal, soft or hard, when in temp control the same combination brings up setting wattage for temp control. Entering the menu system proper is 3 clicks of the fire button which brings up the modes icon by pressing the up button you can change the icon to puff, settings and finally power. When on mode a long press of the fire button brings up watt for wattage mode, now you can use the navigational buttons to scroll through the other modes, Ti, Ni200 and steel. when you choose watt before it takes you to the main screen it gives you the choice of preheat you want, when you choose a temp control wire it first lets you alter wattage for temp control and then allows you to enter a TCR value. When you move in the menu system to the settings this allows other options like adjusting your ohms, stealth mode or adjusting the contrast of the screen moving to power in the menu system is where you turn off the device. 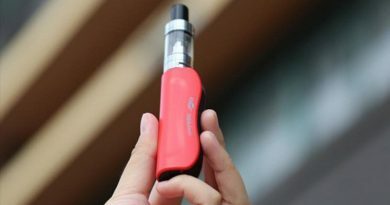 The Baby Mag in my opinion will appeal most to people just starting vaping or people moving to there first mod and the menu system in my opinion is simple enough to navigate around for the new vaper. The Baby Mag as like most devices these days fires without noticeable delay and the feel of the device in the hand can’t be faulted, the ergonomics are spot on and the inwardly curved fire button is particularly nice. How well the device works in temp control i would have no idea but i had no issues using the device with the Baby Prince at 40 and 45 watts in power mode. I did think the 1600mAh battery life would be a big draw back and while it would stop me having this as a main device i did find it lasted fine for when i was out and about. I also worried bout the rocker bar for the up and down operation being where you wrap your fingers around would cause adjusting the wattage by accident but this wasn’t an issue as the navigational buttons need a decent amount of pressure to operate, not once did one of the buttons get clicked by accident. 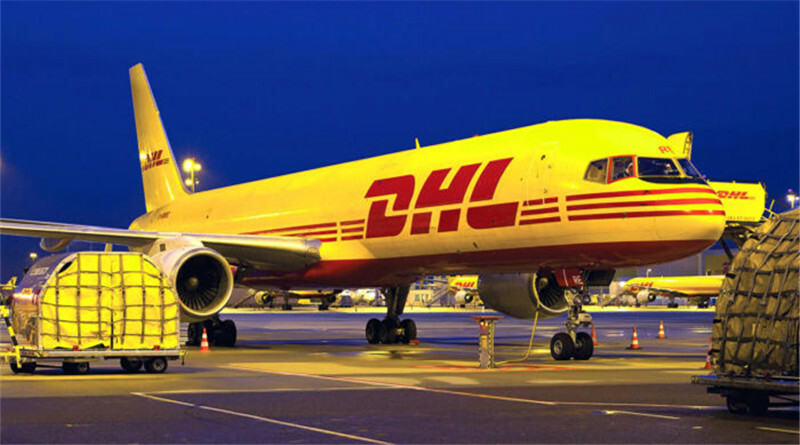 The device will accommodate up to a 26mm tank without overhang and is firmware upgradeable. I apologise in advance to the 99.9 percent of people who know about battery safety but if you are going to use devices with internal batteries please don’t charge unattended and definitely don’t leave charging overnight. The Baby Mag is the Q-Box in a mini Mag’s body and the Baby Prince is a Baby Beast in a Mini Prince’s body. 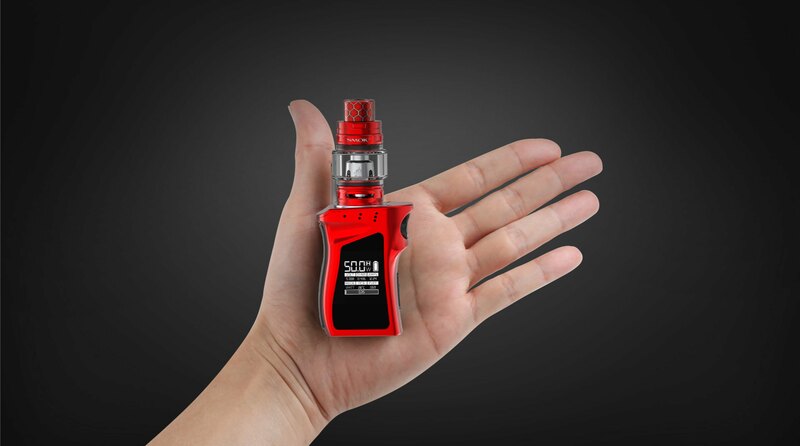 As a device for a starter who is looking for an internal battery device and have identified themselves as a DL vaper not a bad pocket friendly choice but if Smok are going to bring out 50w devices i wish they would go down the MTL route. 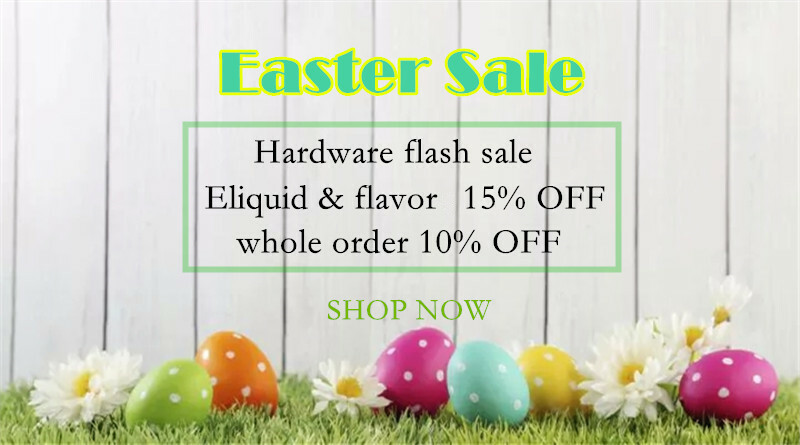 I would once again like to thank Maggie from the Healthcabin for supplying the SMOK Mag Baby 50W Mod Kit with TFV12 Baby Prince Tank for the purpose of this review.